Ireland’s Great Famine, Gorta Mór, had far-reaching effects for the Irish population in the mid-nineteenth century, leading millions to migrate in search of a better future. 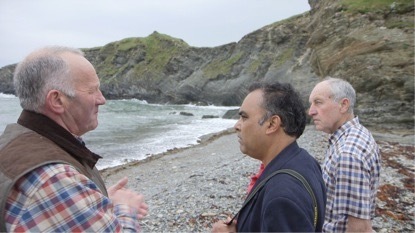 As part of a documentary film project originally presented at The Asian Conference on Film & Documentary 2016, Dr Ian Michael, Fokiya Akhtar and Dr Michael R. Ogden, all of Zayed University, UAE, explore the journey made by Dr Michael’s own ancestor, John Footman, from rural Cork to Madras, India. 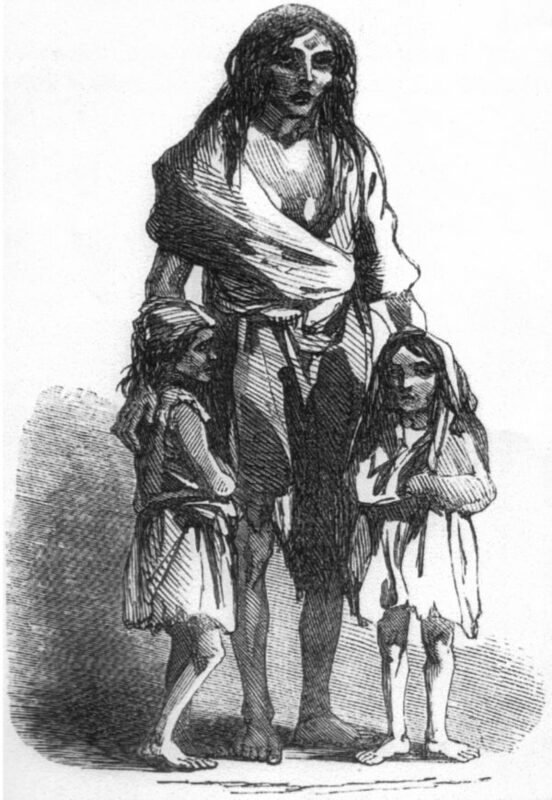 A depiction of Bridget O’Donnell and her two children during the famine (Illustrated London News, 22 December 1849, Public Domain). Boys from Vepery is a documentary movie being filmed by a team that includes myself (Ian), Director Fokiya and Cinematographer Michael. It is a poignant saga of my ancestor, John Footman, and his migration in the year 1847 from his homeland, Ireland, to his adopted homeland of India. John left his home and family, escaping famine-ravaged Ireland all alone to begin a new life in India. He began the Footman clan in India, which I come from; his granddaughter Agnes Footman, born in Vepery in Madras, India, was my great-grandmother. The ravages of the Irish famine killed millions, made millions migrants and rendered millions homeless in Ireland. The purpose of our documentary is to bring to light the extremely rare migration to India of Irish nationals like John during the famine period. People like him braved the seas to seek a better life in far-off lands, settling in India and creating a unique culture there – the Irish Indians. Our documentary is dedicated to those brave and fearless Irish boys and young men who left kith and kin and journeyed to this distant and exotic land called India. An Gorta Mór, the Great Famine, killed approximately one million people in Ireland, and made millions more homeless. Approximately one million emigrated from Ireland, resulting in the island’s population falling by somewhere between 20% and 25%. An Gorta Mór took place from 1845 to 1852 and was a period of mass starvation, disease and emigration. To the outside world, this famine is commonly known as the “Irish Potato Famine”. Gorta Mór is Gaelic for “Great Hunger”, while An Drochshaol means “the Bad Times”. For both the native Irish and those in the resulting diaspora, such as John Footman and his descendants in India, the famine entered folk memory and became a rallying point for various nationalist movements. During the famine period, Ireland was part of the United Kingdom of Great Britain and Ireland; modern historians regard it as a dividing line in the Irish historical narrative, referring to the preceding period of Irish history as “pre-Famine”. 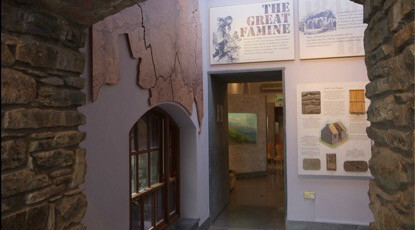 The Famine Story at Skibberdeen Heritage Centre, Ireland. During the famine years, families did not migrate en masse but younger members of families left their homes, with some reports suggesting that the second or third-born in Irish Catholic families were possibly forced to migrate. This became so common that emigration became almost like a rite of passage, as evidenced by the data. Unlike in similar emigrations throughout world history, Irish women emigrated just as often, just as early, and in the same numbers as men. The emigrants started a new life in a new land, and by 1851 migrants had sent remittances to the tune of almost £1.5 million back to their families in Ireland, which then made it possible for other members of the family to emigrate. Some of the popular destinations for emigration during the famine years of 1845 to 1852 were England, Scotland, the United States, Canada and Australia. By 1854, around two million Irish had left their country due to evictions, starvation and harsh living conditions. In America most Irish became city-dwellers. With little money, many had no choice but to start their new lives in the port cities in which they arrived. By 1850, a quarter of the population were Irish in cities like Boston, Massachusetts, New York, Philadelphia, Pennsylvania and Baltimore, Maryland. In addition, Irish populations could be found in some American mining communities. According to the 1851 Canadian census, over half the inhabitants of Toronto, Ontario, were Irish, and in 1847 it was reported that 38,000 famine-ravaged Irish flooded the city, which had a resident population of fewer than 20,000 citizens. Other Canadian cities such as Saint John in New Brunswick, Quebec City and Montreal in Quebec, and Ottawa, Kingston and Hamilton in Ontario also took in large numbers of Irish people. Since Canada, part of the British Empire, could not close its ports to Irish ships (unlike the United States), victims of the famine could get passage cheaply (or for free, in the case of evicted tenants) in the holds of returning empty lumber ships. The Atlantic crossing from famine-ravaged Ireland to North America was very often a terrifying ordeal for the Irish migrants fleeing their homeland. Much has been written about the infamous “coffin ships”. These ships, often owned and used by unscrupulous agents, were sparsely furnished, overcrowded and stocked without much regard for the safety of their passengers. The mortality rate on coffin ships was often around 30–40%, with insufficient restrictions placed on those who were ill when boarding. The appalling hygiene, terrible nutrition and weeks in subhuman conditions, led to such a high death rate that “it was said that sharks could be seen following the ships, because so many bodies were thrown overboard”. 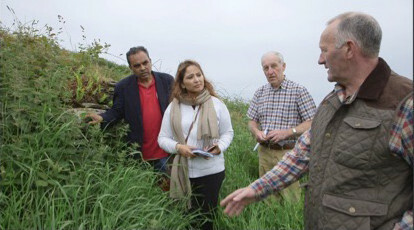 At the site of John Footman’s house in Dundeady, Ireland. Our documentary’s protagonist, John Footman, was just 19 years old when the great famine struck Ireland. He was born in January, 1826 to John Footman (Sr) and Joanna Collins, and he was baptised a Catholic in the parish of Ardfield and Rathbarry under the diocese of Ross in County Cork. The Footman and Collins families worked on the grounds of Castle Freke, owned by Sir John Freke, Bart, the VI Baron Carbery. Castle Freke has a long history dating back to the sixteenth century. It was destroyed by the Cromwellian forces in 1648, and later rebuilt in 1780 by Sir John Evans-Freke, who incorporated the original castle, and since then it has retained its present design. The Collins and Footman family came from the villages surrounding Castle Freke, including Dundeady, Donoure, Dirk Cove and Lisduff. As a young boy and man John grew up around this area, and our research found that his family moved between homes located in these farmlands and fishing villages. It was almost unheard of during the famine period for the Irish to migrate anywhere other than taking the trans-Atlantic route to the United States and Canada. So what John did in 1847 was extremely rare. Stephen Evans-Freke, the descendant of Sir John Freke, Bart, the VI Baron, in an interview with our documentary team, suggested that with John Footman being a member of the castle grounds staff, the Footmans would have never gone hungry even though there was a famine raging. He further suggested that John may have sought some financial help from the Baron to make his way to Chatham (UK), and then set sail as a British East India Irish fusilier. In 1847, aged 21, leaving behind his parents, John and Joanna, and his five siblings, Michael, Catherine, Margaret, Jeremiah and James, John, Jr sailed on board the Kent from Chatham, UK. On board the ship along with John were 227 other passengers, including 213 men, 13 women and 1 child. John’s employer was the British East India Company; he joined their Infantry division, at Madras, known as the Madras Presidency part of the British Empire. On June 3, 2016, 196 years later, our film crew were standing at the crumbled entrance of John Footman’s last home in Ireland, now thick with overgrown bushes of nettles. Local genealogist Michael O’Mahony and local historian Tim Feen, who researched and discovered this place, picked up the tiny new nettle leaves mentioning that this was food for famine-starved Irish Catholic families. This would have probably been John’s last food before he took his last walk down to Béal an Chuain (Mouth of the Harbor) Beach, just a few metres from his home, to take a boat and set sail for Cork, on to Chatham, and his journey to the other side of the world. Upon arrival, John would be 9,000 km from his “green, green grass” of home in Dundeady. One could imagine the near and dear ones that came to Béal an Chuain Beach to bid him farewell, seeing their son, brother, uncle, mate one last time in this world — and this life — before he headed off forever from their midst. There that afternoon would have been the Heas, Hickeys, O’Driscolls, Reily, Long, Twohig, Collins and Footmans, all of them wiping their tears, with hugs, kisses and weeping as John sailed across the Irish Sea on that perfect Dundeady summer afternoon in August, 1847. At Béal an Chuain (Mouth of the Harbour). The Kent, the vessel on which John sailed from Chatham (UK) to Madras (India), journeyed via Cape Town and the Cape of Good Hope. His journey that began from the shores of Dundeady in August 1847 ended when the Kent reached the shores of Indian Ocean at Marina Beach, one of India’s most famous landmark beach situated in Madras. One could only imagine how John and the other Irishmen and Irishwomen initially felt and what they experienced as they disembarked from the Kent, walked across the beach and looked out to Fort St. George, also known as White Town (now one of India’s most historic government buildings, built between 1678 and 1680). The contrast would have hit John like a bolt from the blue; the town of Madras, with a population at the time of around 400,000, compared with the villages surrounding Clonakilty, where he came from, which had populations of no more than a couple of thousand. The Footmans lived in farms and fishing villages that hosted communities as small as a few hundred. The sweet-smelling “green, green grass” of his emerald isle had now completely disappeared from his horizon, giving way to the heat, dust and humidity of Madras. John, along with Patrick Donovan, John Downey, Thomas Kilmartin, James Keily, John Lawless and more than a hundred others that made their way to Madras on the Kent were drafted immediately into the 102nd Regiment of Foot (Royal Madras Fusiliers). This regiment was an infantry regiment, originally raised by the British East India Company, after the Indian Sepoy Mutiny in 1857; later, it was taken over by the British Army in 1861. John’s army record indicates that he transferred to the British Army in 1861 when he was based in the Tiruchirapally, fondly called “Trichy”, part of the Madras Presidency. The Indian Rebellion of 1857, commonly referred to as the Sepoy Mutiny, was a rebellion in India against the rule of the British East India Company, which began in May of 1857 and lasted until July of 1859. The rebellion began on on May 10, 1857 when sepoys of the East India Company’s army mutinied in the cantonment of the town of Meerut, but soon escalated into other mutinies and civilian rebellions principally in the upper Gangetic plain and central India. The rebellion, which posed a considerable threat to the East India Company’s power in the region, was contained only with the fall of the state of Gwalior on June 20, 1858. The rebellion had wide-ranging effects, including the dissolution of the East India Company in 1858, and the British reorganisation of the army, the financial system and the administration in India, whereby the Crown, as the new British Raj, thereafter directly controlled all government and military. Vepery was the suburb in which John settled down when he first arrived on the shores of India; he would have stayed right on Vepery’s Barracks Road. The army barracks is among the oldest neighbourhoods developed during the British settlement in the city of Madras. Christian missionaries started arriving in the neighbourhood as early as 1749, soon after the Treaty of Aix la Chapelle, when the city was restored to the English from the French. As he progressed to become an officer in the 102nd Regiment of Foot, John would have travelled and lived in the scenic headquarters of the army unit in the small hamlet of Wellington, near Ooty (now Udhagamandalam). Six years after leaving the ravages of the Irish famine lands of south Cork, John married an Indian Manglorean (from Mangalore, South India) girl named Matilda. They had six children: Mary, Michael (named after John’s elder brother Michael, who lived in the farmland of Dundeady till the ripe old age of 82), George, Patrick, Christopher and Evangeline. In 1877, at the age of 51, while still serving in the British Army, John passed away, his death certificate stating “disease of the heart” as the cause of death. My Irish ancestor John, my great-great-great-grandfather, was born 191 years ago in 1826 in a land far, far away from India. As I script the documentary Boys from Vepery, I ruminate on how family departures and separation – and the emotions attached to them – would have been. Given that John’s parents, his siblings and his good mates around Dirk Cove and Dundeady would have known that they would never see or hear from him again, it must have been hard to let him go. How would John have felt in the last weeks, days, hours, minutes and seconds before he passed away? Would he recall memories of his childhood, hanging around with his brothers Michael, John, Jeremiah and James, his best mates Patrick Hickey, John Ford, James Heas and others out at their favourite haunts: the beaches of Inse Duine (Inchydoney), the Long Strand, the Red Strand, the Galley Head Light House, the thick foliage around Castle Freke? Would he have ever known that good friends and close neighbours, those who chose a very different journey, a different fork in the road, that they would take “coffin ships” to Canada and the United States? Some of his mates would be the ancestors of America’s famous men, such as the 35th President of America, John Fitzgerald Kennedy (fondly referred to as “JFK”), and one would be the forefather of a certain Henry who gave America its first mass produced automobile — the Ford Model T.
In 1890, 13 years after the death of the Irishman John Footman in distant Wellington, Ooty (Udhagamandalam), Madras Presidency, Ireland saw the birth of her greatest hero, Michael Collins. The General, or “Big Fella” as he was passionately referred to, was born to the Collins clan (John’s mother was a Collins). The “Big Fella” was born on a farm at Sam’s Cross, a short distance from Castle Freke and the Red Strand. The Anglo-Irish Treaty signed on December 6, 1921 under the leadership of General Michael Collins, who represented the Irish side, provided for a Dominion status — an Irish Free State” — whose relationship to the British Commonwealth would be modelled after Canada’s. Echoes of the 1847 migrant life of John Footman are still playing out today, as we see political and economic refugees who try desperately to seek safe haven in nations around Europe, in Australia, in the United States and in Ireland. From Ireland, 170 years ago, John sought refuge from the devastating “Gorta Mór” when he left his homeland’s “green, green grass” as an economic refugee, and travelled to India. Featured image | Irish immigrant memorial, Philadelphia, USA. Kevin Burkett, Flickr. Dr Ian Michael first presented this research at The Asian Conference on Film & Documentary 2016 Kobe, Japan. Dr Ian Michael, DBA, is Associate Professor of Marketing in the College of Business at Zayed University, UAE. His teaching and research focus is on Branding, Destination Branding and Integrated Marketing Communication. He is also looking into new trends in tourism such as Genealogy and Diaspora Tourism. Fokiya is Assistant Professor in the College of Communication and Media Sciences at Zayed University, UAE. Her documentaries have won official selections and best film nominations at Mumbai International Film Festival, Golden Gate Fiction and Documentary Film Festival, San Francisco Film Festival, International Children’s Film Festival and Delhi International Film Festival. Dr Michael R. Ogden is Professor and Assistant Dean in the College of Communication and Media Sciences at Zayed University, UAE. He is an experienced teacher-scholar and practicing media producer with a focus on cinematography, documentary and transmedia storytelling.